Right switching speeds on the car is the key to successful driving. "Mechanics" is only at first glance seems complicated. If you work out, you will begin to shift gears, absolutely not thinking. 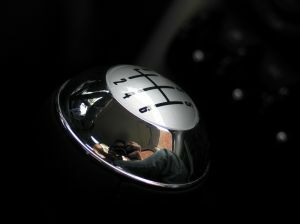 Predominances manual transmissions have from 4 to 6-speed shifter + reverse. The first gear(speed) is included at the beginning of the movement. For this you need to squeeze the clutch and the shift knob rotate left and up. Transaxle downshift to second gear when accelerating up to 30-40km/h. To activate, depress the clutch and put the transmission from the first down to the left. The third gear is engaged at a speed of 40-50 km/h declutch, the handle of the transmission from second speed to first move to the neutral position and then immediately right and up. The fourth gear is engaged at speeds of 60-80 km/h On some machines, allowed the inclusion of up to 100 km/h From third gear when you pressed the clutch, put the gear shift knob down to the right. The fifth gear is engaged at a speed of 100 km/h From the fourth gear with the clutch depressed, turn the knob up much further to the right than third gear. If after this the car had an unusual sound, a buzz, it means you messed up fifth gear with the third. Turn the knob to the neutral position and turn the gear once again. Reverse gear in most cars is activated when the switch handle from the neutral position a slight push down strongly to the right and down. On some models, the Vase, the reverse gear is activated by a small push down, left, up. Automatic transmission, peredachka convenient because you do not need to squeeze the clutch and shift gears yourself - the machine does everything itself. At the beginning of the movement need only to translate the handle in position D(drive), release the brake and the car roll itself. For braking used only the brake pedal. If you want to stay, you must set the pen to position P(parking). To enable reverse gear activated position R.
Relatively recently a box-a robot that combines mechanical box, and the machine. The system itself looks like a automatic switch. On the wheel there is a special button that allows to switch the machine in position mechanics.